Fine yellow flour obtained from milling 100% first quality Greek durum wheat. Ideal for the production of the traditional yellow bread Limnos with excellent taste, excellent flavor, good swelling, perfect yellow color with a thin crisp crust. The limnos bread is the authentic Greek country bread that is made from all the precious extracts of the durum wheat with no artificial additives. In the old days the limnos bread was made only in the country areas, and much later in the city areas, that is why it was given the name, 'country bread'. Its' primary characteristic is its' yellow color, exceptional taste and its' preservability. 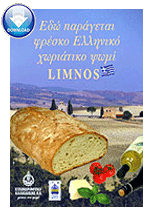 The name Limnos comes from the famous durum wheat seed Limnos that has been widely used in the area of Chalkidiki and in the general northern part of Greece, as well as the Island of Limnos which is also in the northern part of the Aegean Sea. Given the geographical location and the climate that is effected by the coastal weather, the best durum wheat is produced in these areas. Limnos bread is known through out Greece as the country bread that was baked in wooden forms known as 'pinakotes' and always with the addition of sourdough. Traditionally, Limnos is made with sourdough and not with yeast. Even today, bakeries that want to achieve the traditional characteristics of the Limnos bread, with its aromatic flavor, preservability and flexible dough use sourdough. In all traditional recipes, Limnos is made with olive oil and olives that the area of Chalkidiki is also famous for. It is well known that in ancient times, the monks from the areas of Chalkidiki (Athos) produced bread using durum wheat found in the areas of Chalkidiki as well as olive oil, olives and sour dough.From these same areas, we continue the tradition of the monks and produce the same delicious durum wheat bread. Limnos Bread is made from 100% first quality durum wheat, 98% yellow kernel and contains 99,99% of the exceptional quality found in the durum wheat. The protein levels are much higher than that found in white bread and therefore it is better dietary wise. The times shows way towards traditional bread types and the largest percentage of demand by the Greek public is for Limnos Bread. The recipe for Limnos is also used in other products such as traditional pita, pizza and Italian bread. Today Chalkidiki Flour Mills s.a chooses the best grades of durum wheat from the areas of Chalkidiki, under strict quality control and we produce Limnos flour, which bakeries use to produce a wide range of products. Also Chalkidiki Flour Mills s.a is very famous for the exceptional quality of Durum flour of Limnos in all of Greece.